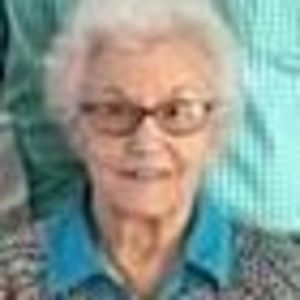 Mary Evelyn Sappington went to be with her Lord on Wednesday, July 5, 2017. She was born to Carl and Ruby Simmons on November 24, 1928. She married Gundy Sappington in February of 1948, and they spent most of their lives in the Locust Hill Community, until his passing in 2005. She was a public school teacher, serving students in Tupelo Public Schools and Pontotoc City Schools. She was a member of the Retired Teachers Association and the oldest member and Sunday school teacher at Endville Baptist Church. She loved her Lord, family and friends, and keeping her home spotless and her yard beautiful. She is survived by her children, Phill (Shelia) of Hackleburg, AL, Jim (Marilyn) of Pontotoc, and Gregg (Debra) of Sherman. Her grandchildren, Justin (Misty) Sappington, Brandi Brown (Brad), Casey Sappington, Mitch McCoy (Kyla), Allie and Kyle Sappington. Her great-grandchildren, Gunner and Blevin Sappington, Brayden and Brody Brown and Deuce McCoy. She was preceded in death by her parents, her husband of 57 years, Gundy Sappington, an infant son, Randall Keith Sappington, her brother, Thomas Simmons and her sister, Doris Brandon. Services will be at 1:00 PM on Friday, July 7, 2017 at Endville Baptist Church with Rev. Larry Hill officiating; burial will follow in the Endville Cemetery. Browning Funeral Home in Pontotoc is assisting the family. Pallbearers will be Justin Sappington, Brad Brown, Clay Collier, Chance Collier, Mitch McCoy and Kyle Sappington. Visitation will be from 6 to 9 PM Thursday at the funeral home and from 12 to 1 PM Friday at Endville Baptist Church.